As well as capturing faster signals, the PicoScope 4000 series also outperforms other scopes thanks to the 250 million samples of ‘always on’ the PicoScope 4000 series ensures that you can effortlessly capture every detail of the signal. Never again will you miss those hard–to–find intermittent faults. The high ±200 V input range of the PicoScope 4000 series eliminates the need for external attenuators for most vehicle tests. A major innovation on the 4425 are the independent floating inputs; think of it as 4 separate 1-channel oscilloscopes in a box all sharing the same timebase and control. This means that all inputs can be used in differential mode (e.g. CAN_H and CAN_L signals), or across non-grounded components such as 12V injectors or for voltage drop testing using a single input. 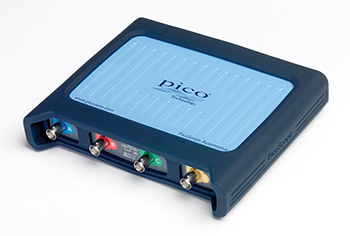 The new PicoScope 4225 and 4425 scopes include a handy feature to detect when you have made a good connection. When you are trying to probe in those difficult to reach places, the new PicoScopes can display the connection status on your big screen ensuring fewer frustrations with poor connections.